Piega Premium Wireless offers hi-res streaming and high-end speakers | What Hi-Fi? Forget chocolate and watches, Piega wants Switzerland on the map for wireless music systems. Already well-known in high-end audio circles for some impossibly pricey speakers built around the company's ribbon twitters, Piega has now launched its first wireless speaker systems. 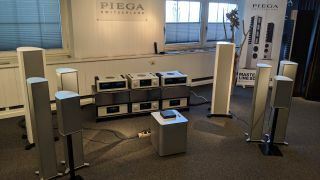 There are three systems in the Premium Wireless range, each featuring a pair of active wireless speakers and the Piega Connect wireless box (but sadly not Piega's reference speakers or T+A kit, as pictured in the company's demo room, above). There's one pair of bookshelf speakers and two sets of floorstanders in the series. The systems simply require power and then form their own wireless mesh network, so they won't rely on your home wifi network. The Piega Connect can connect to a source or other components via analogue and digital inputs (optical and coaxial), and the system supports lossless, hi-res audio. All the systems also come with aptX Bluetooth, so you can stream straight from any Bluetooth device, such as a phone, tablet or laptop. The speakers themselves are based on the recently launched Piega Premium speakers and feature the company's own, hand-made ribbon tweeters and distinctive aluminium cabinets. The Premium Wireless 301 is the entry-level standmount model and has the LDR 2642 MKII ribbon tweeter, a 14cm midrange driver and a 100-watt amplifier. The floorstanding Premium Wireless 501 cuts a slim figure at just 16cm wide but squeezes in the same tweeter as on the bookshelf, plus two 12cm mid/bass drivers and a 180-watt amplifier. The top-of-the-range Wireless 701 comes with the LDR 3056 ribbon tweeter, two 14cm mid/bass drivers and a 200-watt amplifier. While some of Piega's speakers come with six-figure price tags, the Premium Wireless systems are certainly at the more affordable end of the company's products, albeit still fittingly premium. A special Premium Wireless 301 package with system and Connect box will cost £1999, otherwise the 301, 501 and 701 speakers will cost £1980, £3980 and £4980 respectively. The Piega Connect is £499. We were impressed when we heard the Piega Classic 5.0 speakers, so we look forward to reviewing these new wireless streaming systems very soon.